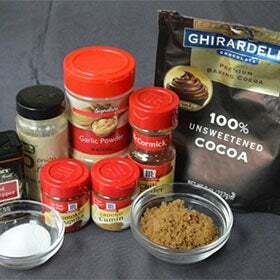 Chocolate takes deserts to awe inspiring heights, but to limit such a versatile ingredient to the sweets table is a short-sighted mistake all too many people make. Take a walk on the wild side and see how just a little bit of cocoa powder can infuse an ordinary roast with extraordinary flavor. 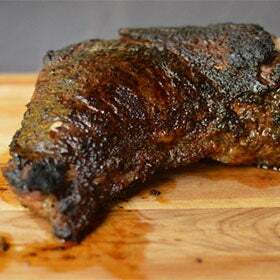 2-4lb Tri-tip roast or your preferred cut of meat. Trim roast of some of the excess fat and pat dry. 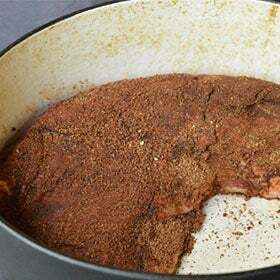 Mix all the dry ingredients together to make the dry rub. Using your hands, coat the roast liberally with the rub. You want every inch of your roast to be covered with the blend of spices. 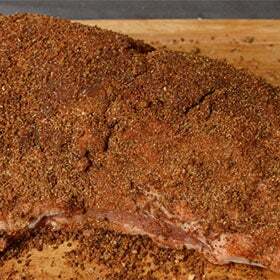 Allow the roast to sit for at least 30 minutes to let the flavors of the rub start to work their way into the meat. In a large dutch oven on a hot stove, pour a couple tablespoons of olive oil. When the oil is hot, place the roast, fat side down, in the dutch oven to sear. Cook the roast on that side for 3 minutes or until it comes up easily. Flip the roast over and cook for an additional 3 minutes or so on the other side. Once the roast has been nicely seared, slide into the oven. 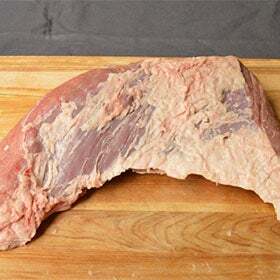 Allow meat to rest for 10 minutes before slicing. You can cover it with a foil tent to keep it warm. Set the dutch oven back on the stove. Add the wine (red or white), using a wooden spoon to scrape up any roast drippings that have attached to the bottom of the pan to make a nice au-jus sauce. Cook on low heat until the alcoholic smell from the wine has evaporated. 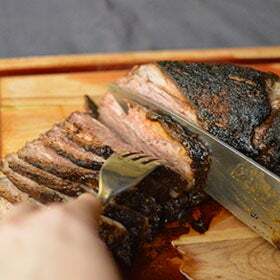 Slice roast against the grain and add any new juices and drippings to the dutch oven. Serve roast with au-jus on the side.